Of course, in the late 1800s, “global warming” wasn’t yet a thing. Wilde passed away 68 years before New York Magazine even released its first issue. 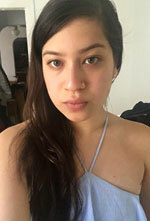 He never had a chance to read “The Uninhabitable Earth.” Nor did he experience a winter during which “a string of days 60 and 70 degrees warmer than normal baked the North Pole, melting the permafrost that encased Norway’s Svalbard seed vault — a global food bank nicknamed ‘Doomsday,’ designed to ensure that our agriculture survives any catastrophe, and which appeared to have been flooded by climate change less than ten years after being built.” These days, the weather makes for fascinating (if sobering) dinner party conversation. Still, where there are storm clouds, there are silver linings. For Fall 2017, designers throughout the fashion capitals were preoccupied with the extra-fashion world environment (political, meteorological, etc.). Many ceased to make wholly superfluous clothes and focused on more functional — in some cases even weatherproof — designs. Outside, a handful of showgoers emulated the runway trend…out of necessity. (Heavy rain put a slight damper on Paris Fashion Week.) 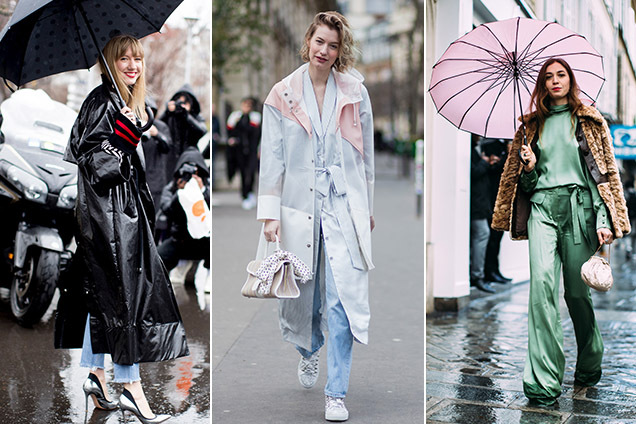 While many simply pretended the shower wasn’t happening — fashion people aren’t exactly known to prioritize comfort — others leaned into the forecast and broke out their thoughtful, dare we say chic, rainy day outfits. 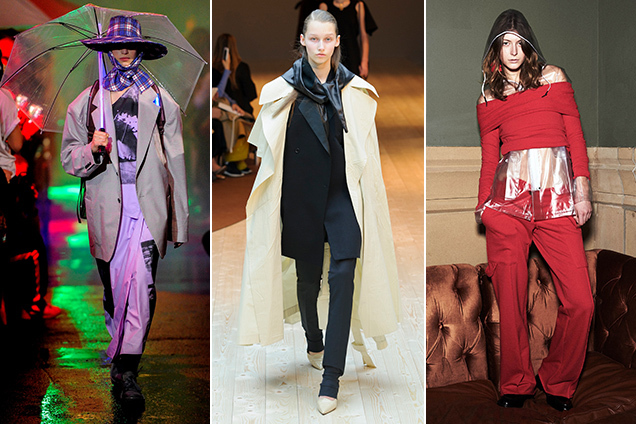 Stylized umbrellas and cleverly cut raincoats in unexpected hues made for fun foul-weather fashion. Be like Simons and Philo. Embrace change. Adapt to it. Look upon precipitation with anticipation. Combat the elements in slick, stylish coats, rain boots that could easily be mistaken for regular ol’ boots, cute floppy hats and statement-making umbrellas. All of which you’ll find in the slideshow below in our roundup of the best rain fashion to shop now.